A little piece of Americana is waiting for you in Sharonville, Ohio. The Root Beer Stand hasn’t changed much since 1957 but it’s surroundings have. What once was a main thoroughfare has now been replaced by industrial buildings. Don’t let this deter you since once you pull into the lot, the industrial buildings seem to fade away and you are transported to an earlier time and, if you’re lucky, you may hear the thundering of a train as it passes by. Our family always enjoys making a pit stop there over the summer. Since it’s only open seasonally, you’ll want to put this on your summer to do list. We like to make a day of it and we’ll visit Sharon Woods first then head over for a late lunch. If you visit The Root Beer Stand, you’ll want to try some of their delicious root beer. It is handmade and an ice cold mug of root beer will definitely put a smile on your face. Originally it was known as the A&W Root Beer Stand but when the A&W franchise dissolved in 1982, The Root Beer Stand was renamed and has carried on ever since. I love that it is still a family-owned business. If you visit, remember that the place is small so you may have to wait for a spot at the counter. But your kiddos will be happy if you do since mine love sitting at the counter and ordering their hot dogs or hamburgers and drinks. They also have little games they can play to keep them occupied until their food comes and they will also be entertained by the amount of ball caps hanging from the ceiling. They won’t have to sit for too long since the service is not only friendly but fast. Their menu consists of hot dogs, hamburgers, and sandwiches. Their specialty is their famous footlongs and they are yummy (plain/$2.50, with chili or chesse/$3.25 and my favorite with chili and cheese/$3.75). 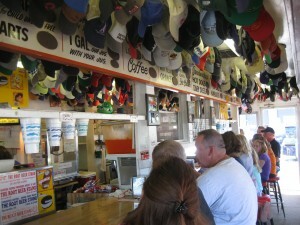 You can also get either a mug of root beer or you can order by the jug – a gallon is $5 and ½ gallon is $3. If your whole family is going to have root beer, this might be the way to go. They also serve orange soda by the jug. If root beer is on the menu, then you know that ice-cream should be too. So, if you want a delicious root beer float, then this is the place to be. All the floats come with two dips of hand dipped Velvet ice cream and they are a root beer lovers dream (small/$2.50, large/$3.50, quart, 3 dips/$4.50 – they also have a smaller junior size for the little ones). You can also enjoy other hand dipped ice cream flavors and ice cream novelty treats. After we eat, we like to take our ice cream outside; behind The Root Beer Stand is a nice outdoor seating area complete with picnic tables, trees, and some umbrellas for shade. There is also a small playground for the kids to enjoy. On our visit, there were quite a few people enjoying the day out back. There was an older couple, a family with a young baby and a couple with a dog. In fact, I’d say The Root Beer Stand is dog friendly since I saw at least three dogs stopping by with their owners (they stayed outside of course). One final thing to note is that The Root Beer Stand only accepts cash so make sure you visit an ATM before you get there since you’ll be so disappointed if you aren’t able to enjoy a frosty mug of root beer. 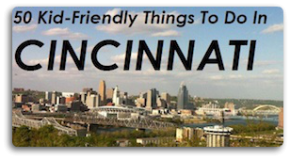 You can dine in or call in advance for take out (513) 769-4349. If you have any suggestions on other unique places to eat, please leave a comment below. We’re always excited to hear from our FFC viewers on places they love.